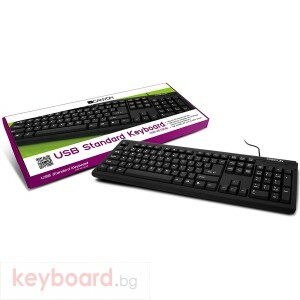 Beautifully made ​​ultra wired keyboard CANYON with full size standard keys very easy to operate. With it, you can get the print, and make fewer typos. Convenient keys mezhklavishnym optimal distance allow you to work more comfortably. When you click behave very nice - they do not makes a clicking noise that could annoy the user, gaining a large number of texts, the course they have a soft, all this can be printed easily without sticking or missing letters. Each key on the keyboard can withstand 10 million keystrokes, which is equivalent to 6 years of continuous operation. The keyboard connects to your computer via USB. The keyboard is made of high quality materials and will last you a long time.